FD came out of the gate firing on all cylinders with a full on pack assault for the first 25 minutes of the match. Although they eventually put the first 5 points on the board, the PD pack made them work for every single inch, with a 20 minute long goal line stand. With 10 minutes left in the half, Louie Ducchessi exploited obvious short comings in FD’s backline intercepting a skip pass and taking it in for 5. Paddy Daly’s kick made it 7-5 and the tone was set for the rest of the match. Chris Freda was able to sneak another try in before the half (his second try in as many months on the team), and we led the match 12-5 at the half. The second half continued the same way we left off. Playing together as 15, the backline and pack continued running the ball up the Fire Department’s gut, never taking their hands off the faucet. Another rookie, “Brooklyn Liam” put in his first try, followed by 8-man Pat Buckley giving the Police a overpowering 24-5 lead. FD was able to sneak in 7 with a penalty try, but winger Matt Crowe responded with another cop try. A steady run of fresh legs kept FD on their backs until the final whistle was blown with a final of 31-19, and the 3rd win in as many years for the NYPD. It was a fantastic match fellas, and I couldn’t be more proud to be apart of this team. The man of the match belongs to the entire team. All 35 guys who stepped foot on the field were apart of that victory. We played together as a team, never giving up. A special thank you to Bruce McLane and Mike Riordan for helping us out over the last few weeks and giving us the confidence and knowledge to play as one. Also the Iona and Old Maroon boys for coming and playing their hearts out. You guys are all apart of this club. Also, Chris Freda took a bad stinger last night, causing some herniation in his neck. I’m told he’ll heal up well, but he’ll definitely be on the lam for a few. Great job brother. Happy Father’s Day boys. It’s a special one. We would like to thank everyone who came out to support our team. Being lead onto the field by the famous NYPD Pipes and Drums. Find more photo’s on our fliker page. The British Royal Air Force aka (Flying Pig’s) came on a New York City tour and played the NYPD in what I am told is very English weather. The RAF came away the winner of the match. Thank’s to everyone who supported our annual charity match. A hard fought match was played by both teams. The Bayonne Bombers came away with the victory (36-31) at the end of day. Besides playing some great rugby we where able to raise $6,000 dollars for the Kerry Rose Foundation.We would like to thank the Bayonne Bombers for putting the match together and thank all our supporters and we hope to see you at our next match. 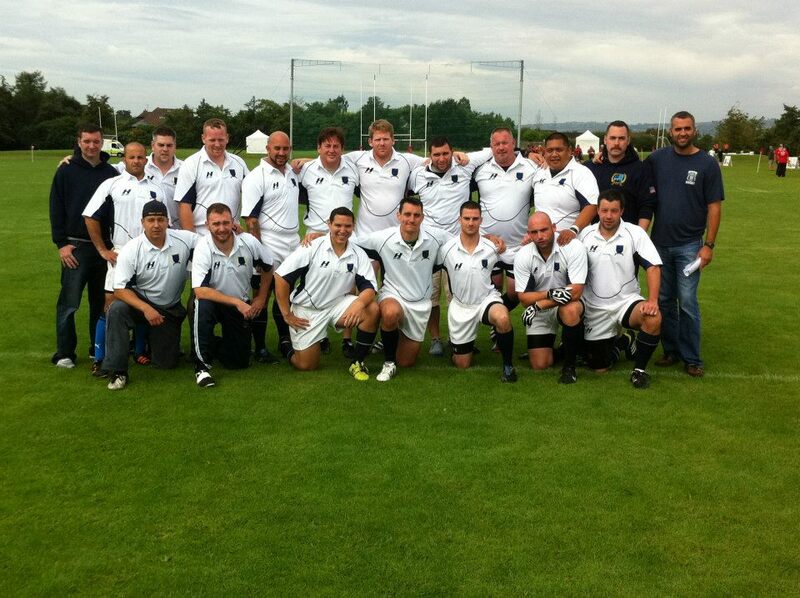 In August 2013, The NYPD Rugby Football Club travelled to Belfast, Northern Ireland to compete in the 2013 Police and Fire Games. 23 Members (2 squads) represented the club in Belfast, competing with some of the best international teams, including: Antwerp Fire Department (Belguim), Rugby San Frontiers (France – Rugby Without Borders), Montreal Bluebacks, Welsh Fire Service, Victoria Police Vikings (Australia), Amsterdam Police, Upper Canada, North Vancouver. Both PD sides struggled against some of the international squads, but were able to pull off a convincing victory over hometown rivals FDNY late on the first day of competition. The entire trip was a great success. 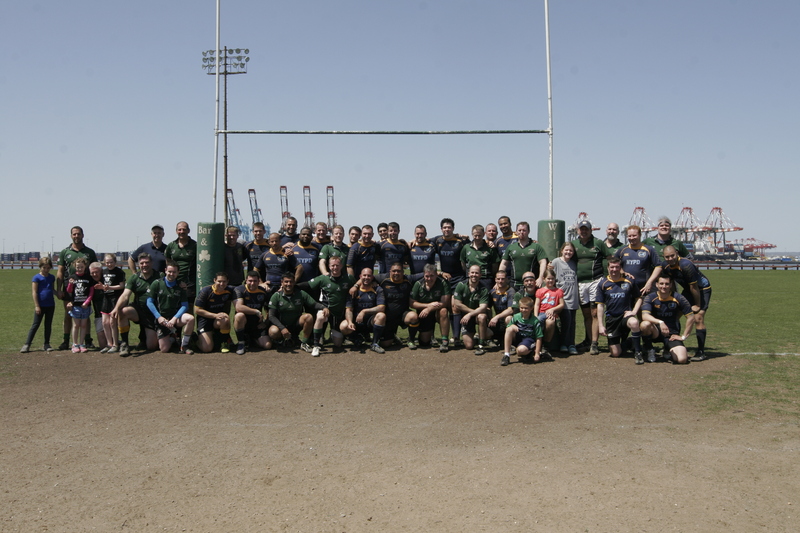 The whole team bonded while experiencing some of the best rugby the world has to offer. After experiencing all that Belfast has to offer, the boys had time for some R&R in Dublin after the games. 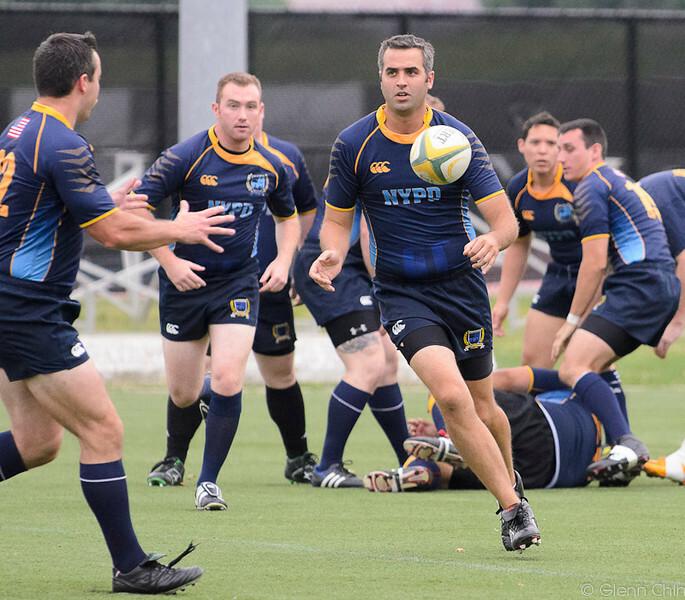 On Saturday June 1, 2013, the NYPD Rugby Football Club played its annual match against FDNY. Every year, the match is played in remembrance of Police Officer James McNaughton and Firefighter Christian Engledrum. Both men lost their lives in defense of our country while fighting overseas in Iraq. The match honors the families of both heroes, and supports military veteran charities picked by the families. This year’s match was played at Gaelic Park in the Bronx, which housed close to 1,000 fans. From the start, FDNY controlled the match. FDNY outgunned the PD side, winning every aspect of the game including the final score. The PD side played tough throughout the match, but weren’t able to fend off a veteran FD team. Despite a tough defeat on the pitch, the PD team showed great efforts off the field by raising over $3,000 in ticket sales. The funds from this year’s match will go to a charity that provides K-9’s trained for disabled veterans. 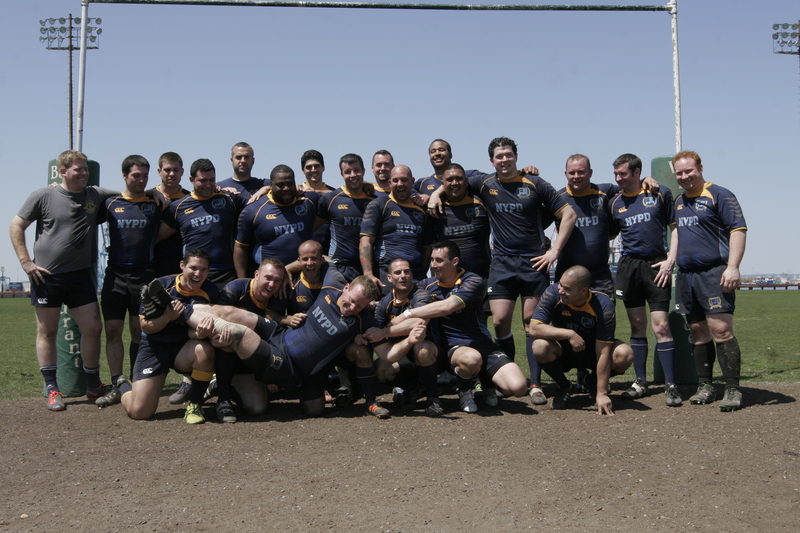 On Saturday April 27, 2013, the NYPD Rugby Football Club took on the Old Boys of the Bayonne Bombers at their annual charity match in Bayonne, NJ. As usual both the NYPD and Bayonne sides played a hard fought, tight match. The score stayed close and both sides traded off holding the lead into the final minutes of the match. The score stayed this way until NYPD scored the final, deciding try, to edge the win. Every year this match is played in support of a favorite charity. This year, the two teams agreed to raise funds for the PBA Widows and Orphans Fund (which provides aid and assistance to widows, widowers and eligible dependents of police officers who have lost their lives in the line of duty). With the help and remarkable generosity of Bayonne Rugby Club, Carla Murnane, Eamon Delahunt, Don, and Caroline Healy, Cian Healy (Ireland Prop) donated the jersey he wore during his last match with France. The jersey was signed by Cian and the rest of the Irish side. The jersey was auctioned off and the two teams were able to raise $6,000 in support of the PBA Widows and Orphans Fund. Kudos to Coach Matt “Burnsy” O’Brien on winning the raffle. And no, it wasn’t rigged. 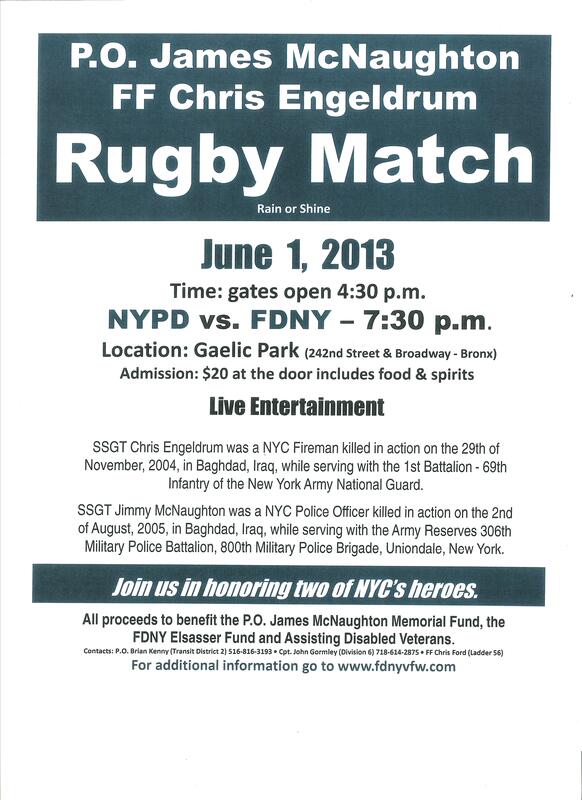 NYPD vs. FDNY Charity match will be played on 06/01/2013 at 7:30pm. Please come out and join us raising money for a great cause. Free t-shirt’s, food, and refreshments will be provided for the price of admission. 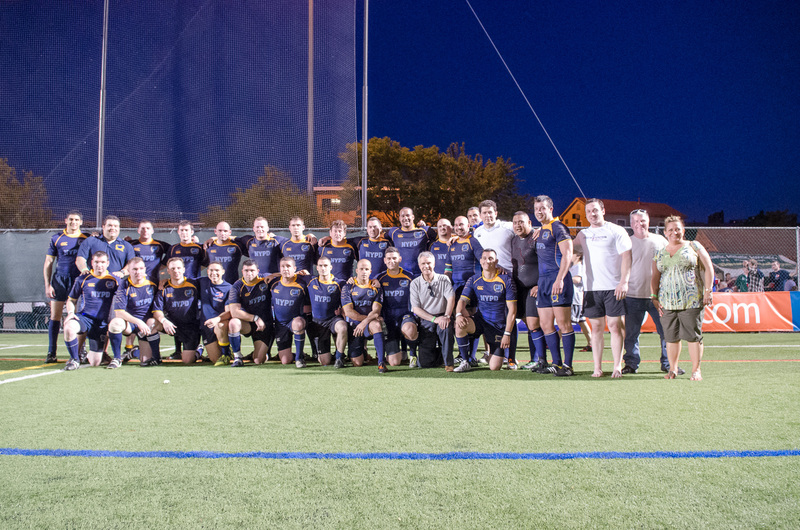 The annual charity match against the FDNY was held once again this year. The game was a success in raising enough money to purchase a specialized bicycle for a former US Army veteran who lost his arm while serving oversees. The team came out strong and fought hard the entire match keeping the game within reach till the last ten minuets of the match. The PD team was unable to defeat the FDNY but played its heart out. We would like to thank all the supporters and fans that came out and supported the team. We would also like the thank the FDNY VFW for all its support in putting the event together. Please check out the link below for photo’s of the match. Local rugby clubs to participate in charity match to raise funds and awareness for Valerie Fund, a non-profit organization which provides comprehensive healthcare services for children with cancer and blood disorders . The Bayonne Bombers Rugby FC will take on the NYPD RFC in a charity rugby match in support of the Valerie Fund Walk on Saturday April 21st in Bayonne, NJ. The Valerie Fund is a non-profit organization supporting comprehensive healthcare services for children with cancer and blood disorders. The Bombers, founded in 1989, are a men’s rugby club from northern New Jersey that competes in Div. 2 of USA Rugby’s Met-NY union. This is the third time that they have teamed up with the NYPD to support charitable organizations, having previously supported the Avon Breast Cancer Walk and the Bayonne Community Cancer Support Group. Directions to 16th Street Park can be found here: http://bit.ly/fZ3vzA It is also accessible via the Hudson Bergen Lite Rail from the 8th Street station in Bayonne.